But my mis-hear got me to thinking (again) about how amazing exercise is for keeping our heads from blowing up—you know, what people with many letters after their names call “mental health.” Every day brings a new study that shows how amazing exercise is for preventing cancer or preventing Alzheimer’s or making your booty look fantastic (all of Instagram), but I am grateful each and every day for the incredibly important role of exercise in helping to regulate my mental state and provide some sort of equilibrium in what seems to be an ever-stressful and careening world of extremes. We need this stuff more than ever. Some days, I think a workout saves me from going all “Dexter” on people. (Read “I CrossFit Because People Piss Me Off.”) It’s not that I’m an angry or unbalanced person (nor am I being treated for any sort of disorder—surprise! ), but I feel much more capable of regulating my emotions when my training and my nutrition are on point. I bet you’re the same way. You know not only how good you feel after a workout, but how good you feel so much of the time just because you regularly lift and run and do crazy stupid things with a jump rope or a kettlebell or an old truck tire. My point here is that, although we know that exercise can help with mild/moderate depression, sometimes we overestimate the quantifiable reasons for/results of exercise, and we underestimate the qualitative effects. We know the objective reasons to exercise (longer life, healthier life, greater strength and fitness), and we try to convince ourselves we should go to the gym or go for a run because of those reasons. That’s all good, but those reasons are not necessarily of greater value to us than the subjective reasons to exercise (ex: “I don’t yell at my kids as much/I’m calmer and happier/People say I’m nicer to be around”). Just because we can’t measure all results with loads of data doesn’t mean they didn’t happen. Sure, correlation is not causation, but if something helps you to get through the day better and healthier, stick with it! Do more of it! Simply put, exercise does help us to get the mean out! The words “exercise” and “exorcise” aren’t that different, after all. (Read “The Devil Inside.”) And, when you think about it, becoming a happier person is a pretty good reason to get to the gym—for you and for everyone in your life. So, just go. In these days of turmoil, your workout is more important than ever. Get the mean out. DT. : A strong favorite in the CrossFit world for a reason—it reaches into your soul. Tumilson: Dumbbell burpee deadlifts and sprints. Somehow, it works. If you haven’t tried Tumilson, do it in the near future. You’ll see what I mean. Murph: You’re simply too tired afterward to yell at anyone. Too.tired. 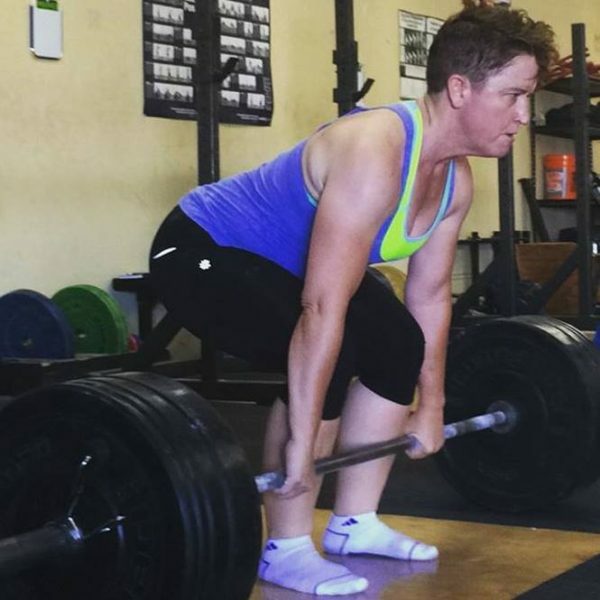 Heavy deadlifts: So primal, so simple, so heavy. A little technique and a lot of aggression can move that barbell from the floor and somehow soar your soul to a new kind of heaven. Anything with double-unders. If you love them, you’ll smile. And if you hate them, you’ll be forced to smile to relax, or you’ll throw your rope down repeatedly. Either way means you’re getting the mean out!